Most people view the constant protests that go on in the University of Delhi as political gimmicks. And while most of these protests may be politically motivated, they teach us an important life lesson on how to speak our mind and raise our voice fearlessly and without apprehension. 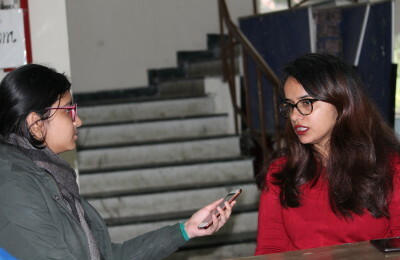 A lot of students view the constant protests that go on in the University of Delhi (DU) as a hassle. I’ve seen friends and acquaintances describe them as a politically motivated menace. Some complaint about the negative impact they have on academics while others simply don’t find the reasons behind them “legitimate” enough. Despite the visible inconveniences that protests seem to bring along, they are still an extremely powerful tool to express outrage and anger. The word protest literally means a statement or action expressing disapproval or objection to something. Definitions aside, for each one of us, the word protest holds a different significance. To some, it may evoke memories of high school history textbooks and their innumerable chapters on the Indian National Movement. For others, it may act as a reminder of the India Against Corruption Movement or the Jawaharlal Nehru University sedition controversy. And while to most of us, the image synchronized slogans and dharnas comes to mind when thinking of protests; its scope isn’t limited to them. Nor is their sphere of influence is limited to the lives of college students and union workers. The right to protest peacefully is one of the most powerful tools in our hands. It is a dignified way to express anger and demand justice. It is easy to be dismissive about protests, call them frivolous, unnecessary and pointless but the truth is this is exactly what makes it so important. Just because an issue seems irrelevant and not worthy outrage to us does not necessarily mean that other lives are not negatively impacted by it. Majoritarian opinion and views are difficult to challenge and defy. Propaganda, business ties with major media outlets and a charismatic leader who claims to not be a part of the system are ways with which oppressive governments slowly seize control. Falling for this ideology is especially tempting when those who oppose it are labelled as “snowflakes” or “anti-nationals”. It is at such times that the culture of protest becomes crucial in ensuring that a country remains democratic. The right to sit down and speak one’s mind is extremely powerful. This culture of protest that disrupts lessons, activities and everyday routine to raise seemingly “frivolous” issues should be our choice of weapon. Because while the definition of frivolous can be easily fixed and put into a dictionary, it’s interpretation in everyday life cannot be. What may appear to be a frivolous issue to one may be a life-altering issue for another; for example- the LGBTQ rights. Maybe a fee hike of Rupees 5,000 does not bother you but for someone else, it might be a huge inconvenience. This culture of protest does not just teach us the dynamics and logistics of organising and participating in a protest, it teaches us the principle behind it, its social significance. The idea that anything that is oppressive, unfair, biased, disrespectful, or discriminating should be actively but peacefully fought against is a beautiful one. It teaches us to challenge status quo, to not be afraid to ruffle some feathers, to ask uncomfortable question and demand that they are answered. It teaches us to use our voice and speak our mind. We are a country that secured its freedom under the leadership of a short, skinny man who wore the homespun loincloth. We owe the foundation of our state to Satyagraha and peaceful protests. Therefore, it is only appropriate that a culture of protest in one of India’s premier institutions should be celebrated, encouraged, and actively sheltered and protected.